Experienced, reliable specialist wedding DJ with modern stylish equipment and emphasis on customer satisfaction. Making your wedding fun, memorable and unique. 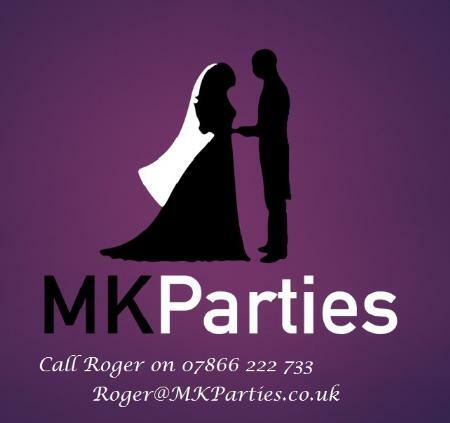 MK Parties offer a bespoke service as your wedding DJ and host. From before your ceremony right up until the very end of the night, relax and let us take the strain. Every event is different so you won’t be getting the same old playlist but we will work together to create something personal for you. All the songs you love and none of the tired clichés you hate! As well as having the perfect choice of music, you need to have a great system to play it through and I have several options to cater from 40 – 400 guests. For weddings the visual impact is very important, whether you want cool and elegant or a big WOW factor make no mistake MK parties can offer something to your taste. I have uplighting to bring your colour scheme together and a choice of effects from projecting your names to scattering hearts across the floor during your first dance. A confetti shower is fabulous for THAT memorable photo! My personal planning and consultation process will ensure that everything is perfect, the music, the overall look, the colours and the timings!